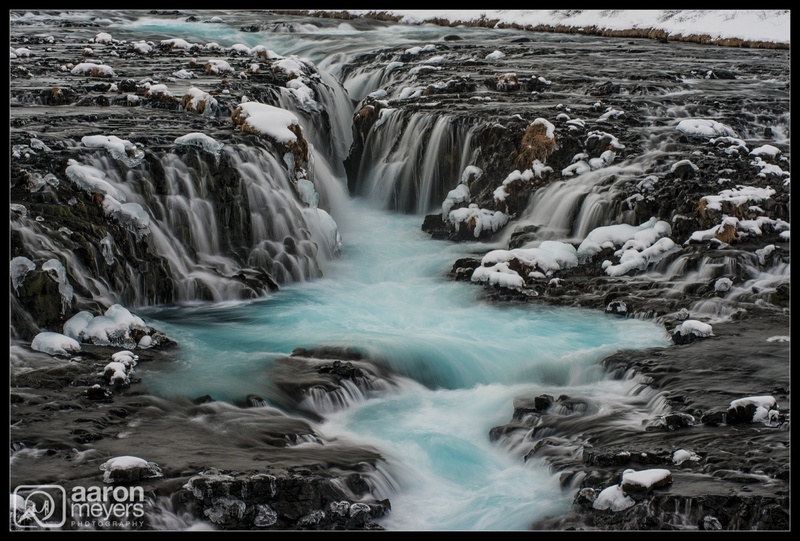 Iceland is known for the massive number of gorgeous waterfalls that lie at literally every turn. Brarfoss (pronounced Broo-ar-foss) might be one of the most photographed waterfalls in Iceland and its easy to see why: it has multiple cascades of little waterfalls that pour into one larger stream as they make their way down several shelves. Throw in the amazingly blue water and youve got a magical scene. I had visited this waterfall on my previous trip, in the summer, and fell in love with this place immediately.The waterfall is located in a residential vacation home area in the Golden Circle (follow Sarah Marino and Ron Coscorrosas Forever Light eBook for excellent directions) and despite having exact GPS coordinates and having been here once before we got a bit lost trying to find it. A few inches of snow on the ground had fallen during the day, which was perfect for photographing the falls … if we could get there. Luckily the residential road was both open and plowed. Unfortunately nothing looked familiar thanks to the several feet of snow on the ground and the fact that only the main roads had been plowed. Pair that with almost getting stuck in the snow due to another car coming by on the 1 lane road, we almost didnt make it We got close enough in the RVs and then Willie, Alan, Rebecca and I walked the rest of the way. I attempted to photograph the falls from a number of angles and different compositions but ultimately I knew I needed to take a photo identical to the one I took in the summer, this time with snow on it.